Directed by Philip Grabsky. 2006. Phil Grabsky's In Seach of Mozart is probably a satisfactory movie. I offer such oblique praise because while I cannot say I enjoyed the film, In Search of Mozart clearly has something to offer. (What that is and for what audience. . .) There are numerous interviews with today's foremost scholars of Mozart, talented musicians passionate about Mozart's music, copious clips of performances, and a grand tour through Mozart's world and life. Yet the experience of watching In Seach of Mozart left me surprisingly unmoved. No, nothing feels out of place and nothing is essentially wrong with the film but I grew bored not too long in. Why? I think it is because the film feels so much like a summary. Now such is not the worst that can happen to a documentary: describing something. The problem is that the essence of Mozart never jumped out at me. In Search of Mozart feels more like a tour or report rather than an experience of Mozart. Let me try to explain why this is so. The main problem is in fact two intertwined: they keep interrupting the music with so-so discussions about the music. In writing Amadeus, which of course receives a few broadsides in this documentary, Peter Shaffer remarked how you could only use so much music before people would grow to loathe the return to the talking bits. The observation applies to film documentaries as well. Regarding the second half of the film's problem, I was quite surprised at the middling quality of musical discussions. The discussions of the music in the film fall into two distinct categories: the outright shallow and the merely mediocre. Discussions with the performers fall almost exclusively into the former category. We hear that this piece has energy, that one has depth, opera is about the human condition. Yikes. Only pianists Imogen Cooper and Ronald Brautigam shed any light on Mozart's style. Lang Lang makes the classic point about the essentially dramatic nature of all Mozart's work. Of the mediocre one might admit that they are in fact explanations, but never the explanations. They are never articulated finely enough to be memorable or specifically enough to be meaningful. On occasion they are confusing. One might consider them, at best, "truthful but unenlightening" and this feels a particular weakness given the wealth of illuminating writing on Mozart. Pick up any random sentence of Tovey on Mozart to see the poverty of these explanations. Cliff Eisen, probably the foremost Mozart authority today, and Volkmar Braunbehrens alternate between myth-busting and what feels like answering review questions from the end of a text book chapter. Only opera director Jonathan Miller and Stanley Sadie, interviewed shortly before his untimely 2005 death amidst a massive scholarly project, manage to speak both intelligently and extemporaneously as they elevate the discussion to more interesting issues of style and philosophy. The chronological framework of the film suffices, following the standard breakdown into 1) the early travels, 2) the return to Salzburg, 3) the Paris and Vienna trips, 4) the return to Salzburg, Idomeneo, and the break with the archbishop, and 5) the Vienna years. Present are the usual quotes, letters, anecdotes, people, pictures (including spurious and inauthentic portraits of the composer), and pieces. The pacing is good but one never feels like anything is actually happening before you. Rather one feels told over and over "he wrote this in this place, here is sample, this is why its good." Such, coupled with the fact that the interviews are often shot in extreme close up, makes the film seem a sequence of talking heads. To be fair the heads are interspersed with pans over the same few photos and footage of random people walking through modern European cities. There is certainly not enough focus on the places Mozart lived and visited. While the beginning of the film explores the place of his birth and they certainly seem to have been driving somewhere, most of the outdoor footage consists of wide-shots of cities and medium-range shots of random people walking around. It is hard to recommend In Search of Mozart without considering its audience. It is of insufficient depth and polish to please a scholar or aficionado. It might, by exposing to Mozart's music, spur someone who likes classical music but not Mozart to listen, but it's not electrifying enough to snare someone opposed or indifferent. The film has a strong cast of experts, few of whom are at their best here. One would benefit from seeking them elsewhere in their scholarship and performances. 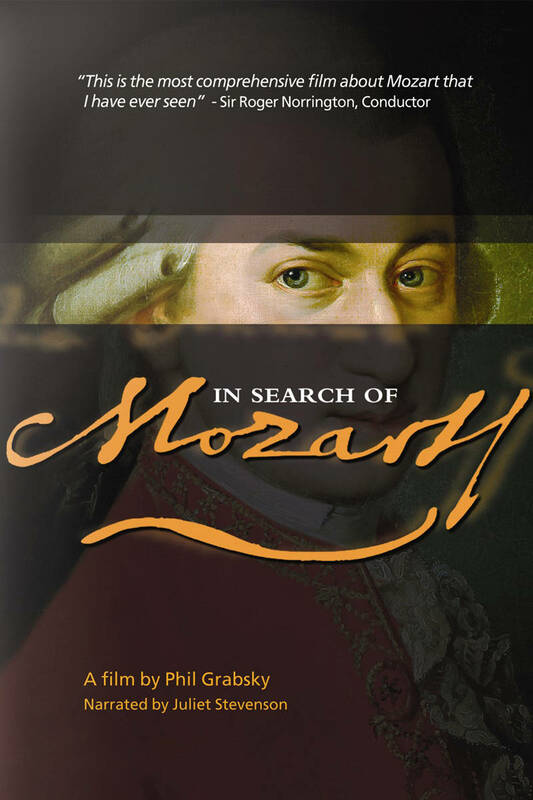 Overall, In Search of Mozart feels like a so-so academic paper whose author, because he did a lot of research and was writing about an important person, didn't think he needed to make any particular point.